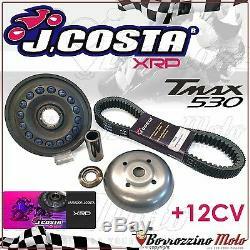 Xtrem racing jcosta xrp variator kit with Kevlar tmax 530 belt. T-max 530 2012 - 2017. The new and exclusive xrp is a kit consisting of a complete speed control and a high quality belt. The new series of xrp (xtrem racing parts) speed control differs from the above by taking radiators in the speed control in a circle provided with projections, between the surface of the rollers and the area of ​​the socket. The cavities of the rollers are drilled for the effect of pressure and depression, which makes them act faster and at the same time at the input to a higher gear, because the output of a lower gear does not show jumps, that is to say makes the air dynamic as dynamic to help rolls emerge or collect quickly without increasing fuel consumption. Improve in: a more fluid performance. Higher refrigeration for less temperature due to the new design of the inverter with sink. Superior reaction on the accelerator, thanks to the press-depress effect of rollers. 185, the consumer has the right to terminate the contract within 14 working days for products from the date of their receipt, without any penalty and without stating the reason. The withdrawal must be expressed by sending, within the 14 days period, a registered letter with acknowledgment of receipt. In this period of 14 days will be returned to the sender by the buyer-supplier all goods purchased intact and in their original packaging and all manuals, without any absence. The return costs will be borne by the consumer. Products may be returned only if they have not been used or tested or are not in sales condition. Under no circumstances, be accepted products with fault-proofing, lack of accessories. The right of withdrawal is not valid for those who can not be considered as consumers by Italian law. Subject to the above, we will refund the amount paid by the consumer within three days from the date of return of the goods by the customer. Iban and account holder details: - the law applies to the product purchased in its entirety; - the products must be returned intact and in its original packaging, complete in all its parts including all documentation and accessories: manuals, cables, etc ... Borrozzinomoto, therefore, reserves the right to modify / adapt the catalog technical products and dimensions, based on what will be announced by the producers, without notice. Orders are accepted by internet (online), or by phone. Deliveries relating to your orders, will be made only by express mail gls executive any delay will be posted by the number of shipments, on the courier related skill sites. Prices may be changed at any time without notice. Bank transfer: 2-3 business days for confirmation. The item "drive kit Costa cross xrp + belt Yamaha t-max tmax 530 2012-2017" is on sale since Monday, July 16, 2018. It is in the category "auto, motorcycle parts, accessories \ motorcycle parts" \ motors, engine parts \ others ".